Ever since Surefire came out with their newest version of the X300U (the B version) there has been quite a bit of confusion as to what the differences are and which is best suited for a particular application. This article will outline the differences and provide some insight as to which would be best for your intended use. Use code: SUREFIRE to save 15% on all lights! REVISION: 08/02/2018 Surefire X300UA/B Upgrade. In 2015 Surefire discontinued the public sale of their popular X300U-A to release the brand new “upgraded” X300U-B model. However since they still had a contract with a government agency to supply them with the older X300U-A model, Surefire decided to make the “A” version available for public purchase again in 2016. Well that’s cool but what’s the difference? Really, there’s not a whole lot. The older versions of the X300U-A (produced prior to 2016 before they were originally discontinued) had an output of 500 lumens. (click here for a great article on lumens) When the X300U-B came out they boosted the lumen output to 600 lumens (another great article is here) while still maintaining the same runtime. Once surefire started making the X300U-A publicly available again they increased its output to 600 lumens as well. The only other difference between the two is the mounting system. The X300U-A uses the older style Rail-Lock® Mounting System. which is best suited for polymer framed handguns. The X300U-B uses the T-Slot Mounting Rail System which is best suited for metal framed handguns as well as AR-15 or similar style rails. The T-Slot system is also used on the X400 series of weapon lights. The main issue that people had been experiencing with the T-Slot style mount on polymer guns is the overtightening of the light causing reliability issues with the gun or under tightening of the light causing the light to come off. The Rail-Lock system is definitely prefered for use on polymer framed handguns but for use on an AR, the T-Slot has some distinct advantages. The only other difference between the 500 lumen models and the new 600 lumen (and now the 1,000 lumen) is the activation paddles. The original X300U-A have a longer narrower design while the X300U-B and new production X300U-A have a shorter, stubbier paddle. Really the only way to tell if you have the new 600 lumen X300U-A or the old 500 lumen X300U-A is to look at the paddles. There won’t be any other markings on the lights themselves that show the lumen output. The old (500 lumen) X300U-A on the left and the new production (600 lumen) X300U-A on the right. It should also be noted that SOME holsters are made for the X300U-A and NOT the X300U-B. It is best to verify with the manufacturer to see if your holster/light combo will work before purchasing. Nearly every holster will work with with both models but it’s always best to verify. The Raven Concealment Systems VG3 Holster will work with both versions. Right now you can get the X300U-B in any color you want as long as it’s black. The X300U-A (600 lumen) is available in both FDE and black variants. 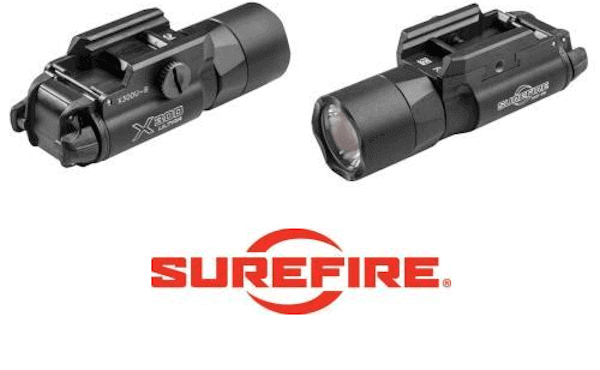 REVISION: 12/20/2017 Surefire XH35 Masterfire. On December 18th, 2017 Surefire announced the release of the XH35. It’s a 1,000 lumen rail mounted pistol light similar to the X300UH-B released earlier this year. It uses the same T-Slot mounting system (covered later in this post) as the X300U-B and uses Surefires Masterfire Rapid Deploy Holster. The Surefire XH35 is meant for use with Surefires Masterfire holster which is an OWB holster that offers active retention and is compatible with nearly every handgun that has the light attached since the retention is on the light. The holster also allows a suppressor to be used on the pistol if desired. The XH35 is NOT compatible with current X300U-A or X300U-B holsters and as of this post there is only one company making an IWB holster for it but more are expected to become available in the future. Dark Star Gear already has an AIWB holster that works with the XH35. They currently have it available as a combo deal on their site. The light itself features a 1,000 lumen output and uses Surefires newly developed MaxVision beam which offers more of a flood as opposed to the traditional concentrated hotspot found on the X300U-A & X300U-B models as well as all their other popular lights from years past. It should be noted that the activation switch is exactly the same as the original X300U-A & X300U-B. Press in for momentary and toggle up or down for constant on. Pressing the switch multiple times will NOT change the output of the light or switch through different modes. The light has different modes but they are only changed by the two buttons on the bottom which are partially shrouded and difficult to move. It’s pretty much impossible to inadvertently switch between modes. The selector on the bottom of the XH35 to switch between modes. X300U-A in front & XH35 in the rear. X300U-A on the left & XH35 on the right. The XH35 on the left & X300U-A on the right. REVISION 07/10/2018 Surefire XH30 Masterfire. At the 2018 NRA Annual Meeting (NRAAM) Surefire announced their XH30 1,000 lumen weapon mounted light. This is basically the same light as the previously released XH35 light but instead it features the Total Internal Reflector (TIR) which is the beam pattern found in the original X300U-A (& X300U-B) as well as nearly every other light they’ve produced. It’s the bean pattern that Surefire is known for and provides deep penetration through photonic barriers and illuminates well at further distances. It is identical in shape, size, function and compatibility with the XH35. The only change to this light is the beam pattern, which for many will be a very welcome change. It’s pretty safe to say that any X300U-A model you purchase from a retailer will be the upgraded 600 lumen version although it may be possible that a few still have some old stock and you may wind up with the lower output 500 lumen version. As time goes on the odds will go down. Every X300U-A that we sell is guaranteed to be the 600 lumen version. These pictures show the stickers that you might find on the package. Thank you for the great article. I have been carrying and training with my x300 for a few weeks now and I am extremely happy with it. I bought from you guys mainly due to your extremely informative article as well as the fact that you stock only the newer 600 lumen models. Cheers! Anyway to get the older x300ua paddles on the new 600 one? Can the head of the XH35 be replaced with that of the XH30,and if so;how much? Thanks!